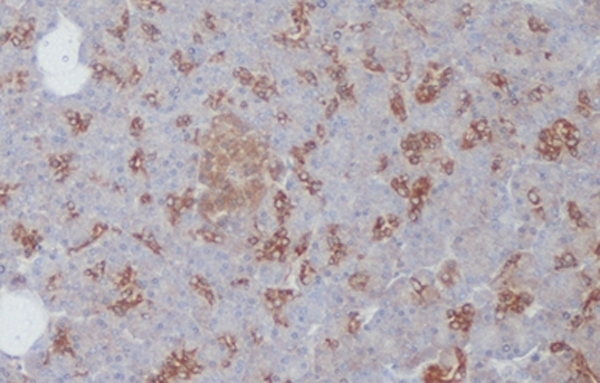 Paraffin embedded human pancreas stained with Mouse anti Human somatostatin receptor 1 antibody, clone sstr1 (MCA5924) followed by Histar Detection Kit (STAR3000A). No antigen retrieval was used. Western blot analysis of NIH-3T3 murine embryonic fibroblast whole cell lysate probed with Mouse anti Human somatostatin receptor 1 antibody (MCA5924) followed by HRP conjugated Goat anti Mouse IgG, visualized by chemiluminescence. Mouse anti Human Somatostatin receptor 1, clone sstr1 recognizes the type I somatostatin receptor also known as SRIF-2. The human somatostatin receptor type 1 is a 391 amino acid, ~50 kDa multi pass transmembrane glycoprotein belonging to the G-protein coupled receptor 1 family. Somatostatin (SST) is a peptide hormone with wide ranging inhibitory effects on hormone secretion and cell proliferation. It is produced as a large preproSST precursor molecule that is cleaved to yield one of two active forms of the peptide: a 14 amino acid peptide (SST-14), or a 28 amino acid peptide (SST-28). The inhibitory effects of SST on hormone release and cell growth have made them candidates for the treatment of cancer and neuroendocrine disorders. Natural SSTs have very short half-lives, which led to the development of more stable synthetic derivatives, such as octreotide and lanreotide, both in common clinical use. The effects of SST are mediated via five distinct SST receptors (SSTRs). The receptors have similar affinities for natural SST-14 and SST-28, but there are marked differences in affinities towards the synthetic analogues. Somatostatin receptors are expressed by various tissues, notably neuronal, endocrine, gastrointestinal and immune cells, as well as certain tumours, with tumours often expressing more than one subtype in different combinations. Schmid, H.A. et al. (2012) Monoclonal antibodies against the human somatostatin receptor subtypes 1-5: development and immunohistochemical application in neuroendocrine tumors. Ozkaya, H.M. et al. (2018) Germline mutations of aryl hydrocarbon receptor-interacting protein (AIP) gene and somatostatin receptor 1-5 and AIP immunostaining in patients with sporadic acromegaly with poor versus good response to somatostatin analogues. Leijon, H. et al. (2018) Variable somatostatin receptor subtype expression in 151 primary pheochromocytomas and paragangliomas. Hum Pathol. Dec 07 [Epub ahead of print].